Mazda has announced details of the all-new Mazda2, saying it ‘brings new levels of technological sophistication, driving pleasure and active safety’ to its segment. The supermini is now available to order in Ireland, for March delivery. The new model is offered in a choice to two petrol and one diesel engine – SKYACTIV-G 1.5 75PS or 90PS and SKYACTIV-D 105PS – with both manual and automatic transmission. Four trim levels are available – SE, Executive, Executive SE and GT – providing ‘a range of premium interior finishes [that] raise the bar for quality and craftsmanship’. Mazda adds that the new model offers a spacious cabin with extra shoulder, knee and legroom, with improved seat comfort and ‘bold, clear, coherent instrumentation and switchgear’. Infotainment is provided via a 7in touch-screen unit and the MZD Connectivity system. Safety options include lane departure warning, cruise control and Smart City Brake Support. The new Mazda2 is the fourth member of the Mazda family with SKYACTIV technology, following the Mazda3, Mazda6 and the Mazda CX-5. Managing director, Mazda Motor Ireland, Tony Howarth said: ‘The all-new Mazda2 represents a huge leap in refinement and practicality versus the outgoing model. 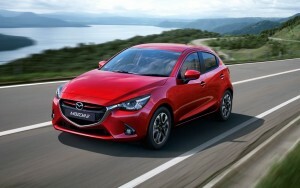 The all new Mazda2 is available to buy now, with prices starting from €15,995. Visit the Mazda Ireland website or its Facebook page for further details.